When robotics entrepreneur Keller Rinaudo, started his first company at the age of 23, the number of drone strikes in Afghanistan were at an all-time high. “Most robotic companies were building things that kill people, so we thought it would be cool to build a company that built things that actually make people’s lives better,” he said. Now his drone-delivery company – Zipline – is making last-mile deliveries of blood to health clinics and transfusion facilities across Rwanda. In one example last year, a 24-year-old mother started bleeding profusely after giving birth via C-section. The doctors called Zipline’s distribution centre, and received seven units of red blood cells, four units of plasma and two units of platelets – more than in the average human body. All of it was transfused, the doctors were able to stabilize her, and today she is healthy. Zipline delivers about 20% of the country’s national blood supply outside of Kigali and has signed a commercial contract with the Tanzanian Ministry of Health to deliver medicines to 10 million of the hardest to reach people in the country. “Entrepreneurship is the only force in human history that has lifted millions of people out of poverty,” says Keller. Like Keller, a Schwab Foundation Social Entrepreneur, many in his community – along with Global Shapers and Young Global Leaders – are at the Annual Meeting in Davos this week to advance leading models of sustainable social innovation. Jaideep Bansal is the Energy Access Leader of Global Himalayan Expedition (GHE), and is working to electrify remote mountain communities using solar micro grids. Some villages in India are so remote that it can take ten days to reach them, and many of these places lack basic utilities like electricity. Here is how he is bringing them light. 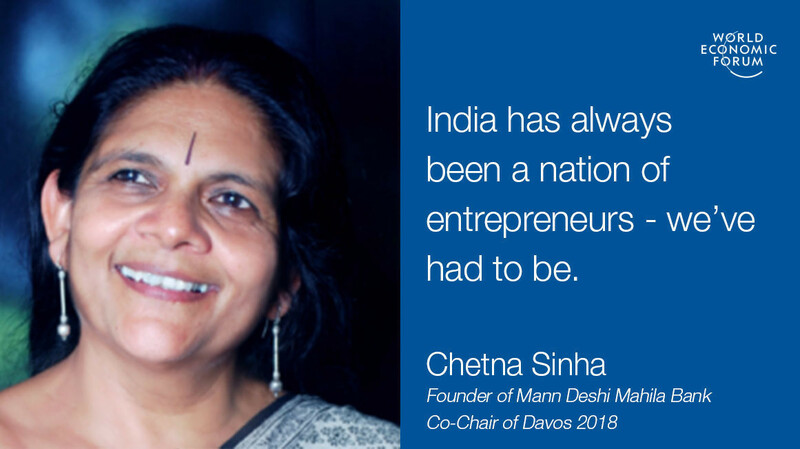 Chetna Sinha, one of the co-chairs of the Annual Meeting in Davos, founded the Mann Deshi Foundation and is dedicated to economically empowering rural women in India. The Foundation started India’s first bank run by and for rural women; business schools providing women with entrepreneurial skills; a community radio station and a community development programme focused on water conservation. It has supported 400,000 women and aims to reach 1 million by 2022. Women make up 70% of the world’s poorest 1.5bn people. So, after Kate Roberts and HRH Mette-Marit, Crown Princess of Norway, met through the Forum of Young Global Leaders, they founded the Maverick Collective to eliminate extreme poverty and engage female philanthropists beyond cheque book giving. The initiative seeks women, not just with their financial resources, but also skills and experiences, to help solve challenges faced by women and girls in developing countries. To date, they have mobilized $60 million in resources for girls and women, helped more than 800,000 girls and women live healthier lives and launched pilots in 15 countries. Food waste and sell-by dates could be a thing of the past. Abi Ramanan, Founder of ImpactVision, uses hyperspectral cameras and imaging to 'sniff' out rotten food and combat supply-chain waste. She also has a grassroots focus and founded a social enterprise that empowers female refugees from Sri Lanka with skills training to launch their own food businesses. Michelle Zatlyn runs a company that encrypts your internet data - with lava lamps. Yes, lava lamps. About 10% of all internet traffic is kept secure by a wall of lava lamps at the offices of CloudFlare, the web performance and security company where she is Co-Founder and Head of User Experience. Rather than being a throwback to the 1960s, the lamps are hooked up to a computer and act as a random number generator, helping to encrypt the requests that go through Cloudflare, which make up 10% of all internet requests. Basima Adulrahman runs a green design and construction initiative in Iraq; a country trying to rebuild after decades of war. She and her fellow shapers in Erbil, the capital of Iraqi Kurdistan, run the Social Cohesion Youth Dialogues where they work on building trust between disenfranchised youth from the various religious and ethnicity backgrounds - a vital step for the community’s efforts to combat violent extremism. Muhamad Iman Usman runs the largest education tech platform for private tutoring in Indonesia, connecting millions of students with over 80,000 private tutors. He’s working with 300 regional regional education authorities and the Office of the President of Indonesia to examine how civic education can reduce the appeal of ‘fake religious news’ to impressionable young people. Fake news is also a concern of Saad Hamid and the research of his initiative, DEMO, examines how ‘fake religious news’ on the internet could impact voting preferences in the 2018 Pakistani Elections. When Carlos Pereira‘s daughter was born with cerebral palsy and so unable to walk or talk, he built a whole company so he could speak with her. Livox created a tablet-based communication tool for people with disabilities. It can interpret user movements through intelligent algorithms and adapt content based on the user profile. Jonathan Hursh of Utopia is rethinking slums in cities by converting them into next generation microcities and generating tech-based solutions. Their latest project, in Mongolia, is turning a sprawling slum of ger tents into a mini city with shared electric vehicles, pre-fabricated homes, 'skinny streets' and high-speed internet. Njideka Harry of Youth for Technology Foundation (YTF) teaches human-centered design, 3D printing, robotics and internet of things to young people in Nigeria. Juergen Griesbeck of streetfootballworld empowers more than 2 million young people in disadvantaged communities annually and is mobilizing professional footballers to give 1% of their earnings towards Common Goal. These are just some of the stories from the 190 social entrepreneurs and young innovators who are coming to the 48th Annual Meeting of the World Economic Forum that takes place in Davos from January 23-26 – joining 3,000 leaders from all parts of society that can help them succeed.